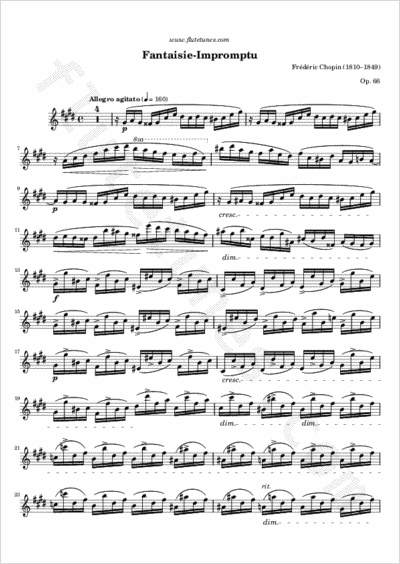 The Fantaisie-Impromptu in C-sharp minor for solo piano is one of Frédéric Chopin's best-known composition. It was composed in 1834 and dedicated to his friend Julian Fontana, who published the piece in spite of Chopin's request not to do so. The piece uses many cross-rhythms: the upper voice is made up of sixteenth notes playing against a bass line of triplets. The opening tempo is marked “Allegro agitato”, but changes to “Moderato cantabile” in the middle section, where the key also changes to D-flat major, the enharmonic equivalent of the more obscure key of C-sharp major, that is, the parallel major of C-sharp minor. In the final section the piece continues in C-sharp minor as before, and concludes in a fantasy-like ending, with the bass replaying the first few notes of the central theme. This same theme was later used in the popular 1917 song “I'm Always Chasing Rainbows”.